Dalhousie Springs, South Australia, Australia, photographs, travel. All photos © Bill Chartres unless otherwise acknowledged. 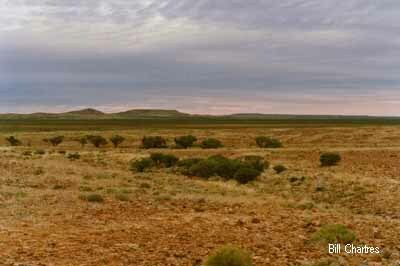 Dalhousie Springs are a group of mound springs on the edge of the Simpson Desert. At the largest of these there is a Camping Ground for those intending to cross the desert to Birdsville. This is the last chance for a "clean-up" and swim before the crossing. Dalhousie Homestead, was located 180k north east of Oodnadatta, it was established by Edward (Ned) Meade Bagot. Telegraph Line between Port Augusta and The Peak. Bagot acquired the pastoral lease in 1872, and the homestead, outbuildings and stockyards were constructed in the 1880’s. Ned's sons Edward Meade (Ted) Bagot and Charles Mulcra Bagot, managed the property until 1885. Dalhousie was abandoned in 1925 and was acquired by the Lowe family (from the adjoining Mount Dare Station) in 1948. "Dalhousie" was always one of our favourite stopovers on our trips through the area. The water temperature is about 38°c and on cool mornings steam raises from the water. and at that time there were no facilities. Enjoy the Christmas Spirit throughout the year. or email us with your thoughts about our Web Site. © 2017-2019 Bill Chartres. all Rights Reserved.